The Bosch brand is one that stands out from the rest of the crowd thanks to its powerful tools and its ability to provide customers with an excellent overall experience no matter what tool they use. 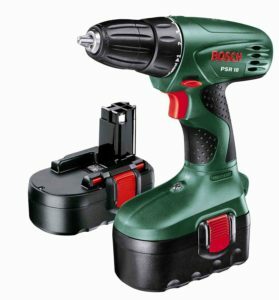 Bosch is well-known for their hand drills and with their release of the Bosch PSR 18 Cordless Drill (VIEW PRICE HERE!) you will quickly see why they are top of the range when it comes to cordless drills. Many consumers around the world rely on Bosch products to go about their daily work routine and it’s not very often a Bosch product lets them down thanks to their reliability. Quick bit change – The keyless chuck this drill provides will ensure users are able to change drill bits within a couple of seconds with no additional tools thanks to this drills ability to let users simply place the drill bit in and tighten the chuck. Forward/Reverse indicator – The forward and reverse indicator will let users know whether the drill is currently in forward or reverse, instead of letting the user guess. Multiple torque settings – Users can change the torque to suit the applications needs with over 20 different torque settings to choose from. Users will also be able to select what mode of drilling is needed depending on the material they are drilling into. Power light – The integrated power light will ensure users are always able to see even when light is limited. The power light will shine right on the application which makes drilling in the dark even easier. Quick change battery – Simply pushing in a button on each side of the battery pack is all it takes to insert and remove it. There aren’t many cordless drills out there that make changing batteries as easy as this one. Soft grip – The soft grip rubber handle ensures comfort and full control during any application, it makes holding the drill very easy and comfortable. Compact design – This drill is very compact and easy to hold thanks to its size and even though it isn’t the lightest of cordless drills, it’s still light and won’t cause any problems when working overhead. Multiple free accessories – This drill comes with the battery pack and charging kit so users will be able to use the drill straight out of the box. Users are also presented with a nice carry case to keep everything together in one place. 3 hour charging dock – The 3 hour charging dock ensures users will be able to get on with their work quickly and the drill holds its charge a lot better than some of the other battery draining products out there so they will not have to charge the product every few hours. There aren’t many better products on the market than this Bosch drill and if you are looking for a drill that is going to last a lifetime and not cost you an arm and a leg to get hold of it, you will find this Bosch PSR 18 Cordless Drill is perfect for any drilling applications. Its powerful 18V motor will ensure it will tackle almost any drilling assignment that it’s given and with all of the features this drill provides makes it a strong contender as one of the best power drills around. Have a look at the many positive reviews this long serving cordless drill has received by its thousands of customers and you will quickly see why so many people have added this cordless power drill to their own toolboxes.